Art Culture Kerala - Kerala, popularly known as God's Own Country, has vibrant arts and culture. Kerala's rich heritage attracts lots of tourists from India and abroad to this beautiful land. Kerala is well known for her Art and Culture. Kathakali is the classical dance drama of Kerala based on the guidelines laid in the Natya Sastra. This dance requires elaborate costumes, ornaments and make up. The performs enact the story through hand gestures, graceful body movements, and facial expressions. Music is very important for this ancient dance. Kathakali is performed in many temple festivals, and mainly by men. 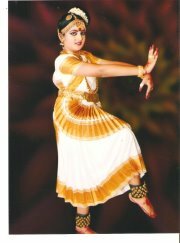 Bharata Natyam is the oldest form of classical dance in India. It is performed mostly by young women in colorful costumes and ornaments, after practising for a very long time. This dance was originally known as "Dasi Attam". Koodiyaattam, Krishnaattam and Margam kali are also form the arts and culture of Kerala. Mohiniyattam is another great classical dance form of Kerala, with grace and elegance, performed by young girls, with a mood of romance. The dance is usually performed on specially made stages during the temple festivals. It is an important part of art s and culture of Kerala. Chakyarkoothu is also known as "koothu". The story narration of this ancient dance generally picked from the Epics, is portrayed with the thandava dance movements, gestures and facial expression, according to the guidelines given in the Natya Sastra. This dance requires colorful costumes. Kalari Payattu is a martial art of Kerala. It is considered as one of the oldest and most scientific martial arts in the world. The training of Kalaripayattu aims at the perfect co-ordination of body and mind and the traditional training in a Kalari include specialization in the indigenous medical practices too.